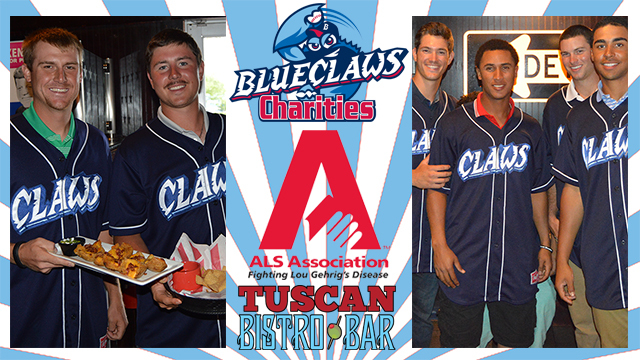 LAKEWOOD, NJ - The BlueClaws are pleased to hold their 15th annual ALS Celebrity Waiter Event on Wednesday, May 27th from 6 pm - 8 pm. The event will be held for the first time at Tuscan House in Toms River, and once again all proceeds from the event will benefit the ALS Association of Greater Philadelphia, the principal charity of the Phillies. "This has been our top community outreach event since its inception in 2001," said Jim DeAngelis, BlueClaws Director of Community Relations. "We are thrilled to partner with Tuscan House this year and are very much looking forward to another spectacular ALS Celebrity Waiter Event."